Lucky bugger I am! This is probably going to be my last place-to-stay in the Perth region, as my host for today, John Cuthbertson, promised me to take me out to his patch of land in the wine region or Margaret River too. "You can watch how the kangaroos eat my olive trees," he wrote me by email before. Jaimes Thorpe had to work at her BP petrol station later today, so it was fine by her to give ma lift back to the city centre of Perth this Monday morning. In Perth I thanked her for letting me stay for a day and for helping me out with an extra idle Sunday. 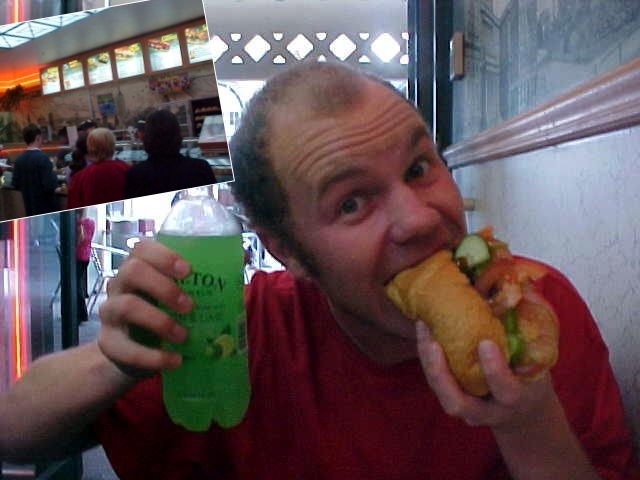 It was the Aussie guy Jeff who had contacted me through ICQ a few weeks ago. He unfortunately could not invite me over at his place as he still lived with his old man, but he did want to meet up with me. He invited me to go to the movies on a morning (so it wouldn't interrupt with my stay with my hosts of the rest of the day that much) and bought me a foot-long bread for lunch! Before we decided to see Men In Black Part 2 (ridiculously Tom Cruise's Minority Report had already vanished from the cinemas here! Was it that bad? 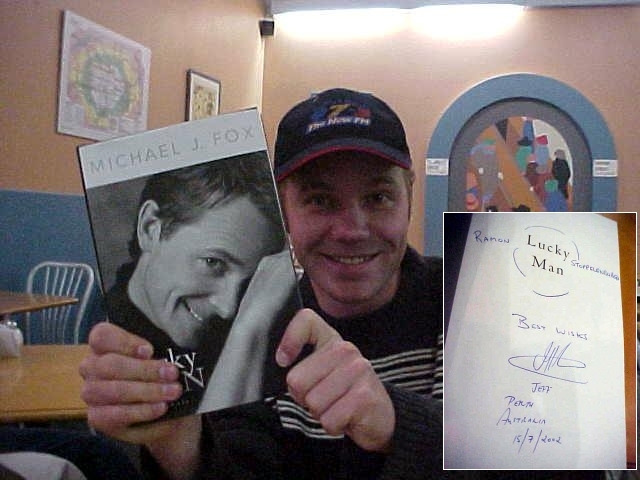 ), Jeff treated me with a cappuccino and gave me a present: the book Lucky Man by Michael J. Fox. "If you ever feel depressed during your travels, read this book and you'll feel much better again." The book is a autobiography of the American author and explains his life living with the Parkinson's disease. I happily accepted his gift! During a lunch at Subways in the Perth city centre Jeff told me that he used to work in the music industry as a sales representative. He was one of the hundreds of people that were made redundant a while ago, as Sony Music is losing a lot of money on illegal distribution through the Internet. I might not be Sony's best friend, because I find the free music on the Internet one of the best inventions of my time. I am from a country where a CD costs about 25 Euros (almost 25 US-dollars), which is of course a preposterous high price for something that is half prized somewhere else. As long as record companies keep those prices up that high, I will be downloading whatever I want off the Internet (talking as I would do at home now!). The singer Janis Ian has written a fantastic article about the downloading of free music. She kills the myth that these free downloads kills the music industry. It might cost the music industry a lot of money (which they have enough, believe me! ), but just those unknown artists and small garage-playing bands can get much more exposure by sharing their songs for everybody's ears, all over the world. She also explains how starting-up artists are being strangled with everything-or-nothing-contracts that will follow them for years and years (thanks to Marieke for the story). After loosing his job in the music industry, Jeff is now a happy manager of a fast food restaurant. Now talking about a change! We separated after lunch and I had another walk through the Perth city centre (why were people on the streets suddenly calling me Mister M&M?). This time I experience Perth without stormy rain clashing down the skyscrapers. John Cuthbertson was my next hosts in Perth. He had invited me after watching the report about letmestayforaday on Channel 9 A Current Affair and was incredible jealous of my idea of course. In the car to his home suburb in Mt Pleasant, some 7km south of the Perth centre, he told me how he is a computer consultant (yes, there are many of them around here). He told me he even worked with my previous Perth-host Reg Simmons, before Reg was made-retired. 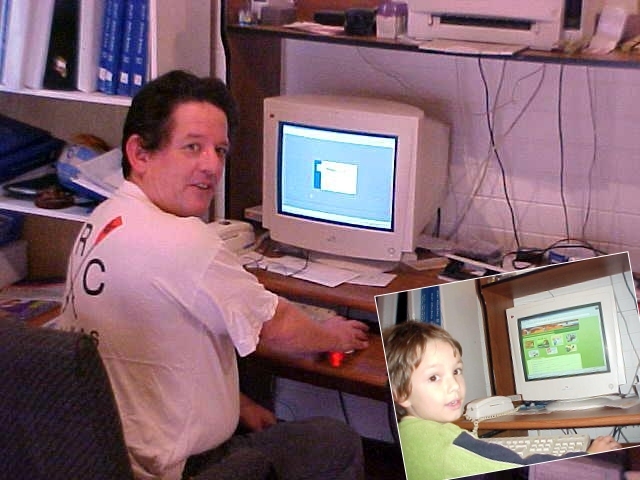 "In the beginning of the 90's I was a manager of a computer company in Perth and we were looking for a better solution to sell our computer books. So some guy in the company said: 'Why not does it through the Internet?'. Then I asked the most embarrassing question of that time. 'What is the Internet?'" After a short drive we ended up at his humble house and I soon met up his family. Every minute I seemed to be meeting another one of his daughters or another grandchild. And still I haven't met them all. 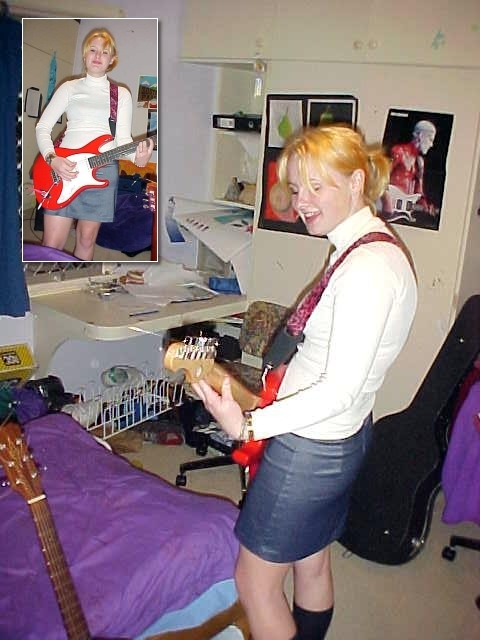 I had a short afternoon nap before dinner that was prepared by the 15-year-old Caroline and I was quite amused when, after dinner, she got her acoustic guitar and sung and played a few songs. The evening started with Anne (23), Caroline and me fighting for a spot on the couch to watch new episodes of The Simpsons on Australian TV, ending up in a tiring pillow fight with Caroline. I am looking forward to tomorrow, when John is taking Anna and me their little shed in the green valleys of Australia's most famous wine region Margaret River. That would be a difference with Perth!